I have had many questions regarding this very situation over the years, and here are some examples of questions received recently. I have a plug that went out. Did not kick breaker off. And now the hot and common leads are both putting out 120 volts? What went wrong? 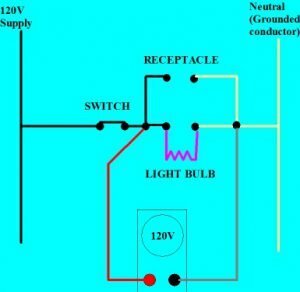 Could you explain the “Neutral” in a circuit as opposed to the ground ? I often wonder why the neutral has no voltage although a circuit is energised. And finally, this is the question that prompted me to do a bit of an educational post explaining the role of the neutral conductor in a circuit. As a sometime-electrical-do-it-yourselfer, you see those white neutral lines in your breaker box or behind your light switch boxes or outlets. They seem fairly, well, “neutral.” Yet I’ve heard electricians say they rather have a run-in with a “hot” lead than the neutral leg (“return”) of a hot, in-use circuit. I’ve never understood why, and I think that a lot of people think you can’t get hurt by a neutral conductor…thought an elaboration on this might be a beneficial thing for you to post on your site. So here it goes, an attempt to explain the neutral conductor, without going too deep into electrical theory. After all, us electricians need to keep some of our knowledge a secret, or you wouldn’t look to us as the genius’ that we really are! In most homes, you have a 120/240V system. This system incorporates two hot legs (red wire and black wire), and a grounded neutral (white) wire. The voltage from each hot conductor as referenced to ground (or neutral) is 120v. The voltage between the two hot wires is 240, a sum of the voltage of the two hot wires. (NOTE: This voltage can vary by 5% either way). 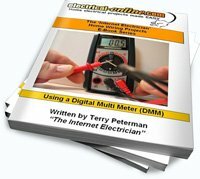 The neutral is referred to as the “grounded” conductor. That is because it is physically connected to the grounding (or earthing) system at one point only, and that is at the main service entrance panel. Then a system of grounding (or earthing) conductors (bare copper, or green) is used throughout all the circuits to provide a path for fault currents (should a problem with the intended path occur) back to earth, tripping the breaker. Here is a diagram of a simple circuit, and what a meter should read when connected in the circuit checking from hot to ground. Meter should read 120v from hot to ground and neutral in normal conditions. Here shows what reading you should get from neutral to ground under normal conditions. This is a line diagram to help simplify the circuit. Checking from neutral to ground in these normal conditions should read at or near zero volts. 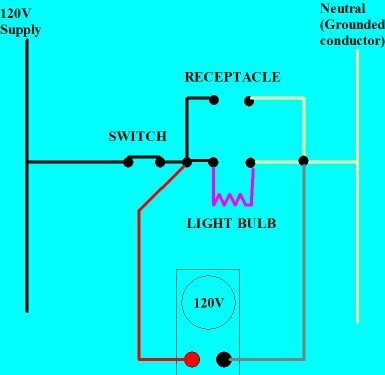 The neutral, grounded conductor is as important to the circuit working properly as is the hot wire, so if the neutral path is broken, the circuit is incomplete. 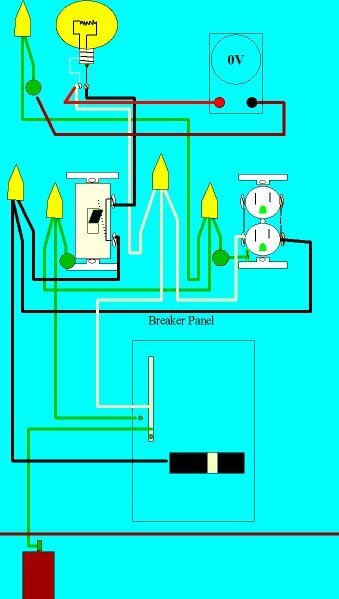 That is why you can have a situation where the breaker is supplying power to the circuit, but the outlet (receptacle, light, appliance, etc.) is not working. This is the situation where a neutral conductor can give you a shock! With the circuit open because of a bad or broken connection, the neutral can have a full 120v (the supply) on it as referenced to ground. If you complete the circuit with your fingers, or from your hand, through parts of your body to ground ………. ZAP. You just became a part of the live circuit! 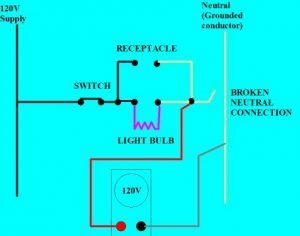 With the switch for the light closed, the voltage feeds through the filament of the light bulb, and (loads) the neutral, but with a broken connection, and no complete path, the light does not work. Any appliance or lamp plugged into the receptacle will not work either. Here is a diagram showing what happens if the neutral path is broken, and the reading on a meter when checking from neutral to ground. Note that here the meter is checking from neutral to ground, and is now showing 120v. This is a line diagram of this condition. 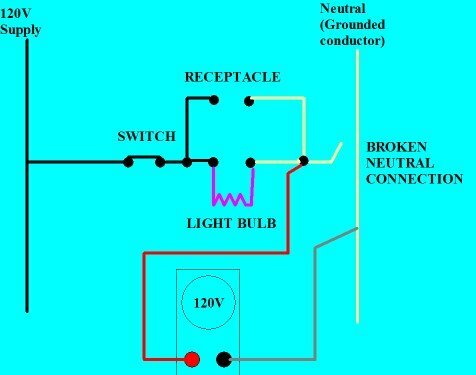 Referring to the question of the receptacle not working, but the breaker is on, and the hot and the neutral side of his receptacle showed 120v, you can see here that checking anywhere on the neutral conductors ahead of the break in the circuit will show a reading of at or near 120 volts, the same potential that will be on the hot side of the circuit. Now you can see how that neutral wire can be as dangerous as the hot wires in a circuit. Under normal conditions not a problem, but with a poor or broken connection, a problem! That is why it is so important not to work on any circuit that is energized! When checking for voltage, always check from hot to neutral, hot to ground, and neutral to ground to be sure. In the case of a broken neutral, checking the outlet with a meter or a neon voltage tester from hot to neutral would not show voltage. A plug tester should indicate an ‘”open neutral” condition. Thanks for all your questions! I’ll attempt to answer as many as I can through various means, either a quick answer on my blog, or if the answer warrants a full post with diagrams, I’ll create a post or video on the website. Keep them coming! This entry was posted in Q & A, Troubleshooting and tagged bonding, breaker not tripped, broken neutral, earth, earthing, electrical outlet, ground, neutral, Outlet not working, receptacle, tripped breaker. Bookmark the permalink.